When I try to think of a perfect day, I always go to this photo. Don’t ask me why. I know I’ve had days that were more fun or adventures that lasted longer. We’d been fishing at a private pond and we’d all caught fish. On the way home, we stopped to show my parents and my father took this picture. Simple in all ways. We had lots of days that were less than perfect and we had many days that were beyond perfect. Why this one? Maybe it captures a minute with all of us not trying to be anything but what we were. It was a pretty day, we’d piled in the car and gone fishing. It was the middle of all our days, the middle days with four healthy children, a happy couple, and our dog, moving through life. I’m not sure any of us would remember too many details about this day, but it was a conglomeration of many others in many places. 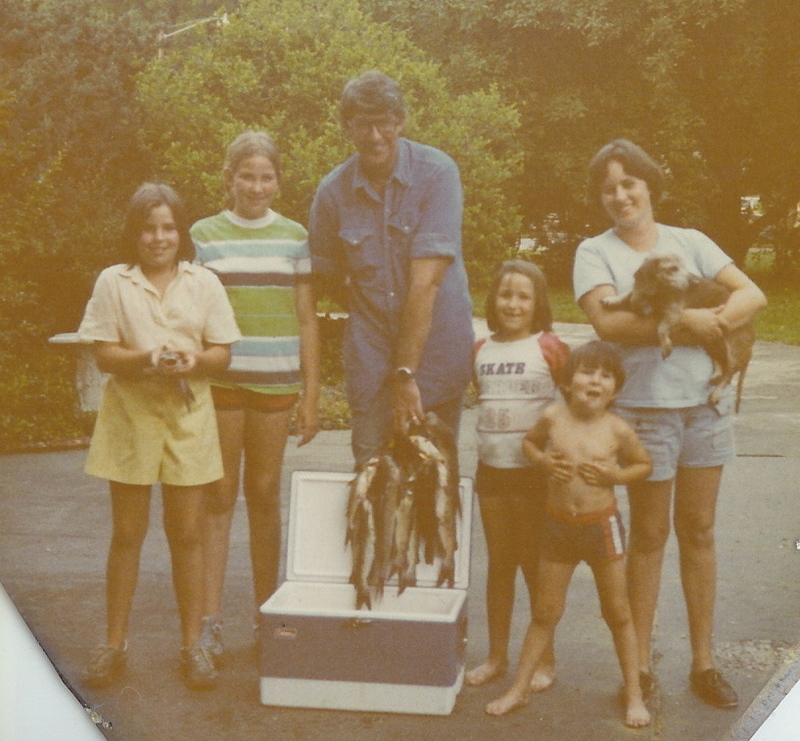 Daddy trying to get everyone’s line in the water and thrilled when we caught a fish. Mommy trying to get us fed and keep the kids from falling in the pond. Nothing out of the ordinary. Maybe, just maybe, I consider this one perfect because memories like this are what kept us all together and got us through the harder times, the sad times. And, times like this are the foundation of our other happy and happier days. And, maybe, because it’s always good to remember that there are people who never get to have a Perfect Day when we’ve had so many. And, to remember that the Perfect Day may not be, and probably won’t be, something you plan. It will just happen and then stay in your heart forever!